Open: 9AM to 9PM EST. Mon-Sun. The AL 650 - is an inside lift that easily locks down virtually any power chair on the market today, without those pesky manual ratchet straps! 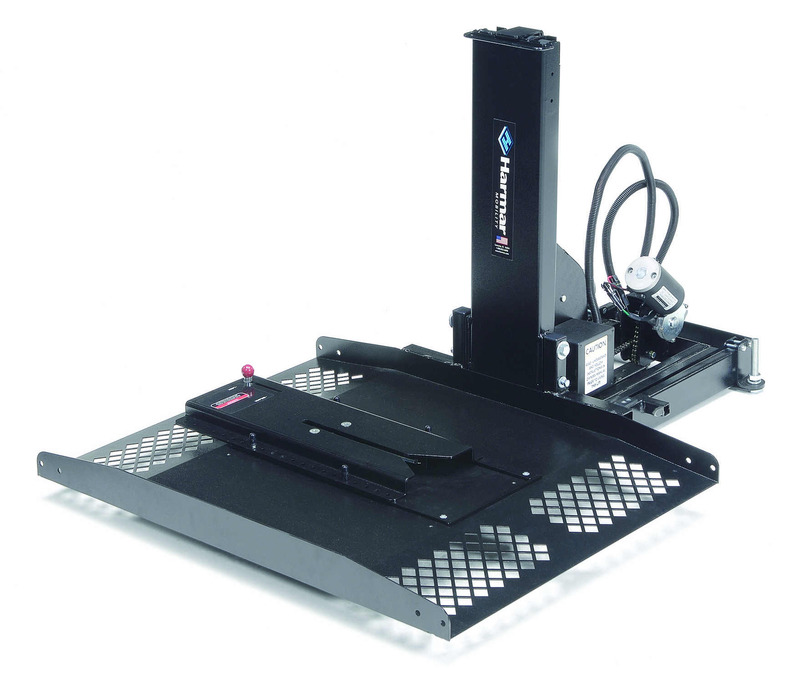 The innovative design of the Auto Lift 650 features the a docking station with a self aligning base that allows the user to simply drive onto the platform and be locked in place. An audible latching sound is heard as the chairs pin passes into the locking mechanism. Then, merely attempting to back the chair will verify that the latch is locked. Additionally the docking base has a brightly colored indicator pin to confirm the latch is in the locked position. Then push a button and the platform raises and retracts inside of your van or SUV. When unloading your electric wheelchair, simply push the release lever and the locking mechanism opens. 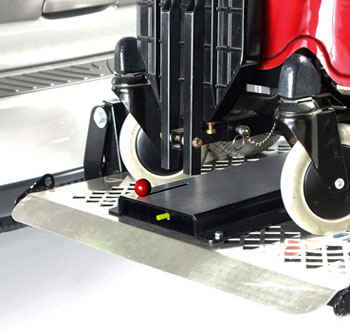 The AL 650 comes complete with all hardware needed for installation, including the docking device that attaches to the bottom of the electric wheelchair that works with the locking mechanism on the platform. This lift will work with most solid frame power chairs. It is not compatible with folding or take apart electric wheelchairs. Lift hatch, push button on remote control, and lift platform comes out of vehicle and lowers to the ground. Drive scooter or wheelchair on lift over hitch. Wheelchair locks onto hitch, securing it to the platform. Push button again and the platform raises up to entry level of your vehicle. The lift continues to pull the platform into the back of your van or SUV. Close hatch and go! Automatic locking system on the platform base eliminates the use of tie down straps. Fully electric, platform lift loads scooter or wheelchair on the outside and brings it inside of your vehicle, with wheelchair or scooter safely secured to platform. Attaches to existing third row seating mounts in most SUV's and mini vans. Lifting capacity of 275 lbs. No damage to vehicles (eliminates the need to permanently bolt the lift into or on the vehicle). Only requires 32" of headroom for installation in your vehicle. Platform Size 27" x 38.5"
Platform dead space 4.5" max.